Do you prefer to nest peaceably on your balcony rather than hangin’ with the crowd around the pool area? Conversely, is your idea of a stateroom simply a place to flop into bed at 1 a.m.—no fancy notions necessary? And do you, like me, tend to go just a little bit crazy if all of your cabin furnishings face aft when you know you’re moving forward? It’s the permutations (size, location, amenities, and price, for example) of the four basic cabin types that can make choosing difficult, so we are providing a guide to help you make the selection that is best for you. Note: Staterooms designed for physically challenged guests can fall into any of the above categories and will not be separated out. The “real estate” that your stateroom occupies, no matter the type, can either make you seasick or keep you up all night with noise—or it can lull you like a baby and provide exquisite views of your surroundings. That’s why doing your homework is important. If you tend to get seasick, cabin location is really important. It’s a question of engineering, really: The lower and more central you are in a ship, the less roll and sway you will feel. 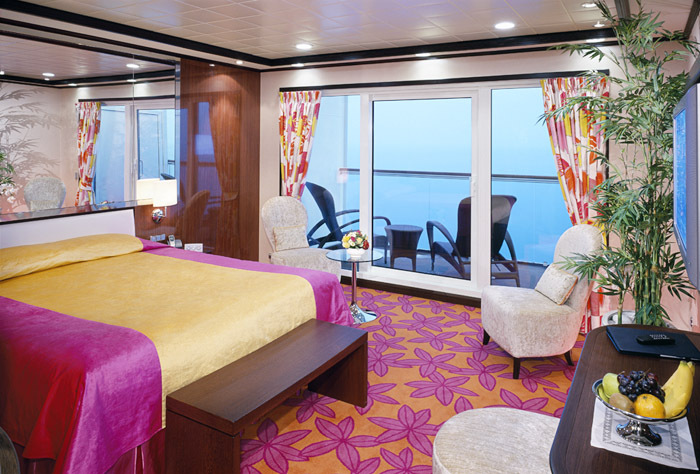 Even if you choose a balconied stateroom, choose the lowest level and the most midship one you can find. For some reason, most cruise lines assign their highest level of cabins to the highest decks, usually just below the Lido Deck (most likely because if you have a window or balcony, you have a more sweeping vista). Still, it’s the Lido Deck that often causes the most noise problems, so if you don’t want to hear scraping chairs at the crack of dawn or yee-hawing pool parties until the wee hours, go down a level. In fact, when it comes to noise, the best bet is to select a cabin that is both above and below other cabins. Other pitfalls? Service areas adjacent to or above your stateroom; show lounges or bars adjacent to, above, or below your stateroom; and those that are either low and aft (because of their proximity to engine noise, vibration, and anchor), or low and forward (bow thrusters). When aft balconied staterooms first became available in the late 1990s, they were disdained by most for at least a year. And then, with the help of Cruise Critic’s member boards and other communications outlets, cruisers discussed their experiences, and the aft balconied cabins became the most prized standard balconied cabins afloat. Why? Because they can make you feel as though you are at the end of the world, offering 180-degree views over the stern’s wake. And, the balconies are almost always at least 50 percent bigger than standard balconies located along the sides of the ship. There are three drawbacks to this location, none of which serve to deter those who love these cabins. They are at the very back and therefore are far away from a lot of activities. Also, they are usually uncovered or only partially covered. Finally, they are almost always “stepped out,” allowing not only those in cabins above yours to see down into your balcony, but those looking over the rail from the Lido and other public decks at the aft as well. Some standard rooms and many suites are located at the aft “corners” of a ship, with a balcony that curves up the side. Take one of those, and you can see where you’re going and where you’ve been at the same time! There are some passengers who love, and swear by, cabins located on the promenade deck, but the design has changed in most recently built ships, and outside promenades are usually located on activity decks now. Still, [% 9823 | | Holland America’s %] Statendam-class ships, or [% 12025 | | NCL’s %] Norwegian Dream, have outside cabins that face the promenade deck and offer the advantage of easy access to fresh air without paying for a balcony. Holland America, in particular, has maximized this for their guests—there are doors to the outside located every few feet. The two biggest drawbacks of promenade-deck staterooms are that they tend to be dark because of the wide overhang above the deck, and anyone can see into them when the lights are on. Close those drapes! Other viewing pitfalls include balconied cabins under the Lido overhang, which limits visibility; cabins above or adjacent to the lifeboats; and forward balconied cabins located close to the bridge wing. If the amount of view you get relative to the amount of money you spend is important to you, look for “secret porthole” insides, or “obstructed view” outsides. The secret porthole cabins are those sold as inside cabins that actually have windows with obstructed views and the obstructed (or fully obstructed) cabins are sold as outsides but often at the price of an inside. And look into the interior-view cabins, like the atrium views that look out onto the interior promenades on [% 15420 | | Royal Caribbean’s %] Voyager-class ships. These are typically sold at a price that falls somewhere between the insides and outsides. Finally, take a good look at your cruise itinerary before selecting your cabin, specifically if you are choosing an outside or balcony. On a round-trip Caribbean cruise or a transatlantic crossing, for example, the side of the ship you are on doesn’t really matter. If, on the other hand, you are doing a southbound Alaska cruise, or a trip from Barcelona to Rome, you might want to consider choosing a cabin on the side of the ship that faces the land. Sometimes the views can be breathtaking and you won’t get those views from the cabins that face out to the open sea.